Conservationists note that the public is moved by what are called “charismatic megafauna.” That means the plight of pandas, elephants, tigers, and sun bears captures attention and inspires donations for their preservation far more than for say, the delta smelt, the Kentucky cave shrimp, or the valley elderberry longhorn beetle. It helps to be big, have a personality, and be cute. So, dolphin are pretty cute, and they have a fun-loving, cuddly personality. What could be more attractive? How about a miniature dolphin? Meet the vaquita. The little dolphin, the world’s smallest, is less than five feet long fully grown and tips the scales at around 100 pounds, soaking wet. Vaquita means “little cow” in Spanish, christened by the Mexican fishermen living in the northern reaches of the Gulf of California, between the Baja California peninsula and mainland Mexico. That is where the vaquita swims, and it doesn’t swim anywhere else. With the smallest range of any cetacean, they stick close to the shallow and somewhat murky waters near the mouth of the Colorado River as it meets the upper gulf, and they do not wander more than about 15 miles from shore. They can tolerate water barely as deep as their own body thickness and don’t care for depths much beyond 90 feet. Their environs are warmer than other dolphins’ habitat, but they can manage water temps that range from the high 50s to nearly 100 degrees. Notoriously shy, vaquita were a mystery to many locals, and only became known to science by way of bleached skulls found on the beach in 1950. Careful study of those remains led to their definition as a new species in 1958. The far northern end of the Gulf of California is the home of the vaquita, and a place where totoaba concentrate. At least for the moment. The vaquita’s characteristic rounded head can be seen here. They don’t come far above the surface to breathe, and aren’t into showy, leaping antics like some dolphin. Considering their aversion to humans, it is a wonder that much has been learned of them since then. Vaquitas tend to stay a good half-mile away from boats, and they don’t rise far above the surface to breathe, nor do they linger there long. Photographs have captured their features, but unfortunately, the best views of them have come from actual animals caught up in fishing nets, and drowned. Vaquita have a rounded head without the beak found on most dolphins, and dark shadowing around their small mouths, which curl up in what looks like a droll smile. That same darkness circles their large eyes, making them look even larger, perhaps inspiring the “little cow” moniker. As would be expected, their diet includes a wide variety of fish, as well as squid and some crustaceans. Vaquita can begin to reproduce as early as three to six years, but it is thought they only produce offspring every two years, half the rate of most other dolphin. At 11 months, their gestation period is rather long, and their lifespan is relatively short, estimated at about 25 years. None of these things augur well for the establishment of large and resilient population numbers. Human divers can’t get this close to a vaquita, but if they could, this is how their sizes compare. Nobody was actually counting back then, but extrapolating from various data, scientists have estimated the vaquita’s population at perhaps 5,000 in the early part of the 20th century. That number had fallen precipitously, to 567 in a 1997 count. Having lost nearly 90 percent of its population in so short a time, vaquita were clearly under siege. Unlike so many other cetaceans, the vaquita had not been the target of hunting, but it is a victim of fishing. The fishermen aren’t after the vaquita, but the gill nets they use for game fish are woefully effective on the little dolphin, which can become entangled and drown. Mexico recognized that the vaquita was in trouble and listed it as endangered as far back as the middle 1970s. Steps were taken to redesign fishing gear to allow for catching shrimp, and fish like the corvina and sierra, but also allow for vaquita escape. This might have saved the population if not for another target species with its own tale of depletion, a croaker called the totoaba. The totoaba, like the vaquita, lives only in the Gulf of California. Fished since the early part of the last century, totoaba gained fame when their swim bladders, an organ that regulates depth, were sent to China. The Chinese had long prized that organ taken from similar species in local waters, so much so that that fish had become scarce there. Used in a soup, or eaten as meat, the bladders were also processed into traditional medicine for illness and sexual inadequacy. The rich could flaunt their weath by giving them as gifts. Totoaba in a tank at the Autonomous University of Baja California. Nothing like the biggest fish of bygone days, two or three times bigger than a vaquita. With a ready market, Mexican fishermen began pulling in the totoaba in massive numbers. These were not guppies. Commonly 100 to 200 pounds, the fish were enormous. They would be sliced open for their 3-foot-long swim bladders, which were dried in the hot desert sun, and the rest of the body thrown on the beach to rot. The Chinese paid well for the bladders, and the totoaba were fished at staggering rates, with millions of pounds landed in the mid-1940s. Hearing of the waste of so much flesh, fish buyers from the U.S. came south with refrigerated trucks to buy thousands of pounds of the unwanted fish for a pittance. This carnage could not last; the catch decreased, and the market dwindled. At least the early fishermen used baited lines which were only marginally attractive to the totoaba, little interested in eating as they concentrated their numbers at the mouth of the Colorado River for spawning. As a further insult, the environment there became far less habitable for the fish over time. Overuse of Colorado River water by upstream claimants meant there was little diluting freshwater arriving, and combined with the high evaporation rates, the delta area became hypersaline. There seems no end to the abuse the fish have suffered. The arrival of bottom-scraping trawlers, the development of gill nets, and the use of dynamite by the late ‘50s and ‘60s meant all the totoaba were at risk, and with few making it to the river to spawn, the fishery was doomed. Still, the totoaba survived as younger and smaller fish. But the Chinese appetite for their swim bladders did not abate. At the same time the Mexican government proclaimed the vaquita endangered, they also named the totoaba as protected. Large gill netting was banned in the early ‘90s, but the totoaba swim bladders only grew in value, and fishermen willing to take a protected species weren’t afraid to use banned gill nets. The size of individual swim bladders has shrunk, but the price for the disappearing resource has skyrocketed. They sell for $26,000 per pound in China—a “large” one by today’s standards can go for $47,000 on the black market. The Chinese have outlawed the swim bladder sales, and though their value has slipped recently, they are still more valuable by weight than cocaine. Some buy them as an investment for future sales. The continued laying of gill nets, curtains that hang down into the water from the surface, has been a disaster for the vaquita, whose numbers dwindle downward. A population count in 2008 showed only 245, and visual and acoustic monitoring in 2015 set their number at 59. Now it is estimated that no more than 30 of them still survive, and perhaps as few as 12. In 2017, a desperate attempt was made to intervene and artificially increase their population. Two wild vaquita were caught in hopes that they would reproduce in an open-water enclosure. The first one caught began immediately to show signs of stress, so was released. The second seemed to tolerate the handling and enclosure better but soon panicked, swam into the net repeatedly, and despite efforts to save her, died of a likely heart attack. That was the end of any such program of breeding. Vaquita are honored at the San Juan de Aragón Zoo in Mexico City by a statue. Sadly, it may soon be our only physical image of their kind. All of this mortality could end if the gill netting stopped, but struggling fishermen who can make months of salary in one night of lucky poaching do not want to stop, apparently until both the totoaba and vaquita are no more. Sadly, cetacean scientists say the vaquita may be so depleted genetically that it cannot re-establish a healthy population and is already doomed to extinction. The story of these two animals, the vaquita and the totoaba, points up the tragedy of short-sighted greed and voracious consumption. Like the buffalo of the Great Plains, the totoaba seemed an endless bounty to be collected and exploited, with heedless waste. As the supply collapsed, hard-working but hungry fishermen continue their disastrous methods to make a living off the last of the ever more valuable, disappearing resource. The desire for status, prestige, and sexual prowess amongst the rich of China makes them blind to the destruction of a once plentiful fish species in faraway Mexico. And the hapless vaquita, an unintended victim caught in the middle, pays for it all. Human need, greed, and ignorance or indifference drive this story, and many others that end with the extinction of a species or the destruction of a habitat. This Earth Day, we would be wise to remember that we too live on the planet that we are destroying, and in time, unless we change, it will be our turn as well. To better understand the environs of the struggling vaquita and totoaba, this wall map of Baja California and the Gulf of California provides a beautiful depiction, including images of some of the vaquita’s relatives. It’s available from Maps.com. 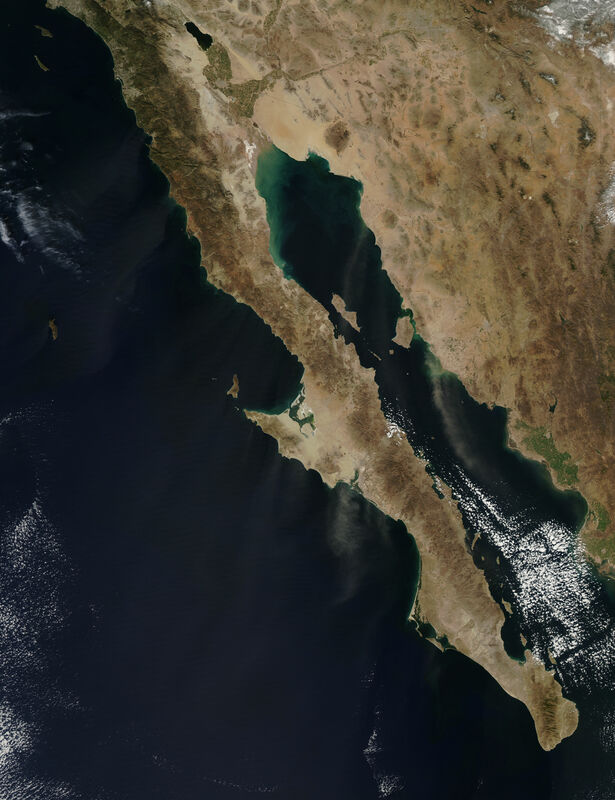 caption: The far northern end of the Gulf of California is the home of the vaquita, and a place where totoaba concentrate. At least for the moment. caption: Human divers can’t get this close to a vaquita, but if they could, this is how their sizes compare. caption: The vaquita’s characteristic rounded head can be seen here. caption: They don’t come far above the surface to breathe, and aren’t into showy, leaping antics like some dolphin. caption: Totoaba in a tank at the Autonomous University of Baja California. Nothing like the biggest fish of bygone days, two or three times bigger than a vaquita. caption: Vaquita are honored at the San Juan de Aragón Zoo in Mexico City by a statue. Sadly, it may soon be our only physical image of their kind.